CBTA is a new training and assessment option for people getting their motorcycle licence. 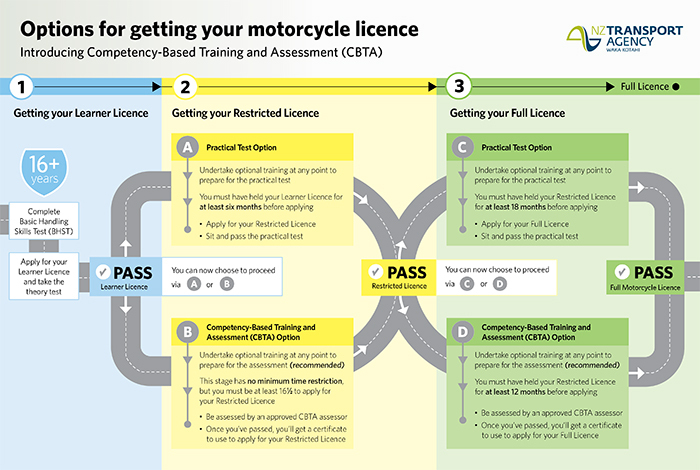 Instead of taking a practical test at the restricted and full stages of your licence, you can choose to have your riding skills assessed by an approved CBTA assessor. Although training isn’t compulsory, we recommend you complete training before attempting the assessment ride. This will ensure that you have the necessary riding skills and you’re fully prepared to do the assessment. The assessments are designed to ensure you’re competent in a prescribed range of riding skills, which are important to keep you safe when riding on our roads. If you choose to do your training through an approved CBTA assessor, you’ll get feedback on your riding skills and you’ll get tips on how to ride smarter and safer. These improvements will help prepare you for the CBTA assessment, and help you make smarter choices on the road. How does CBTA compare with the practical test option? Generally 1 in 3 candidates have to resit thier CBTA Assessment due to thinking that have all the necessary riding skills’, as they just didn’t know any different. *While training is not a compulsory part of the approved CBTA course content, it’s highly recommended that you’re fully trained / prepared before attempting the CBTA course assessment. Our approved CBTA assessors will be able to offer you optional training at any stage of your progression through the graduated licensing system.